By Jennifer Burcke on May 26, 2012 Visit Jennifer's Website. So, you’ve decided to enter the world of chicken keeping. Congratulations and welcome to the club. We don’t have jackets. 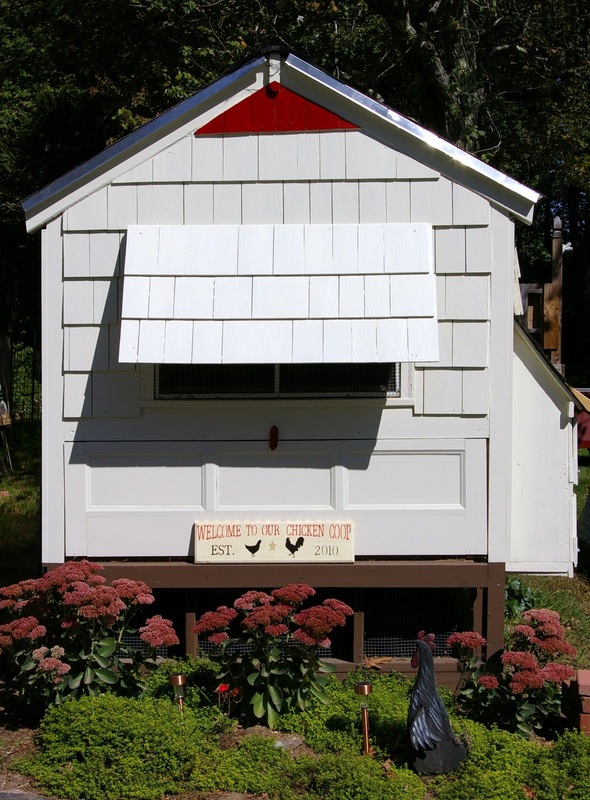 Instead, we have chicken coops in every size, type and color. I think that you’ll agree that a coop is a much more useful. Let’s face it, chickens don’t wear jackets. As soon as we decided to add a flock of heritage breed hens to 1840 Farm, we started talking about the coop that would need to be constructed. We spent hours reading about coops. We spent time talking about coops. The more we talked, the more confused we became. Every conversation led to more questions. Every question seemed to have more than one answer. One afternoon, we found ourselves using sidewalk chalk to sketch the proposed coop on the driveway in the shade of the barn. While it wasn’t a traditional blueprint, it gave us a starting point that we could all agree on. It took a few weeks, but the plans for our coop finally began to take shape. 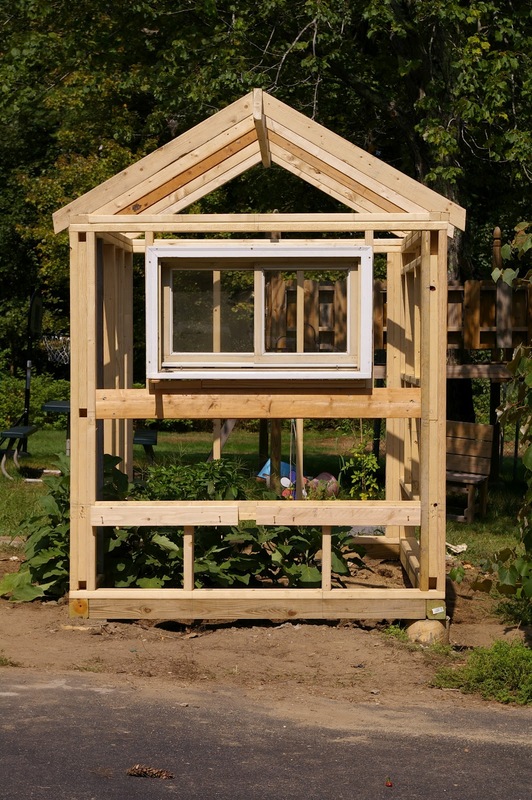 We decided to build our own coop from the ground up. We liked the idea of designing the coop ourselves and this project seemed like the perfect medium for utilizing some building materials that we had on hand. Repurposing is a bit of a tradition at 1840 Farm. In fact, it’s one that has taken hold of all three generations. I’ll often find my two children walking through our barn looking around for materials to build their latest creation. They have learned to find potential in materials that others might find to be unusable. It only seemed right that we would do the same. We had some materials left over from a construction project on the house a few years earlier. We added a few new items after visiting the local Habitat for Humanity ReStore. Now that the idea for the coop was taking shape, it was time to contact our local planning and zoning board to discuss my town’s regulations. Per the zoning for our land, we were allowed to keep an unlimited number of hens and even a rooster if we wanted. The only requirement was that a coop for any more than six hens had to meet a minimum setback requirement from the property line. I made that call on a very rainy summer morning. I had thought that I could wait until a nicer day to measure the distance from the property line and determine the best placement for the coop. I was wrong. I couldn’t stand the suspense. Moments later, I was out in the rain with my family and the longest tape measure I could find. We began measuring and discovered quickly that there was only one viable option for a building site. The spot in our garden where the Heirloom Black Beauty Eggplant were growing was going to be transformed into the chicken yard. Now that we had a plan and a place, we just needed to find the time to construct the coop. Measurements were made and concrete footings were poured. 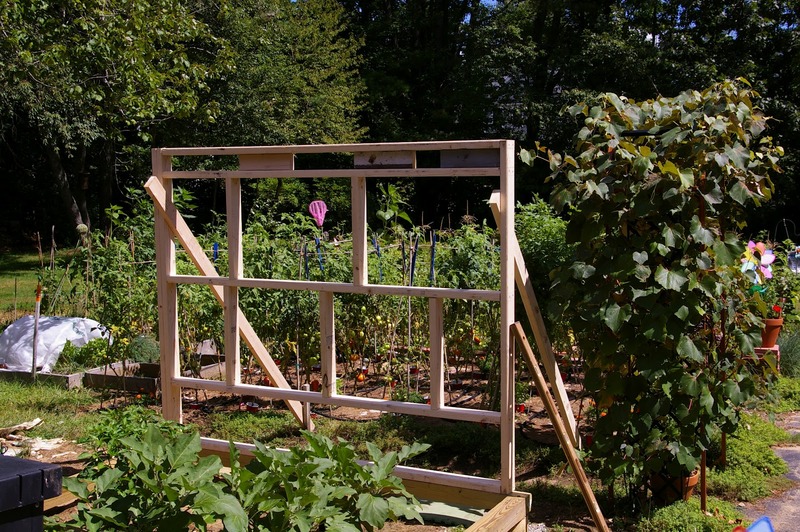 Once they had cured, we began framing the coop. It started to take shape and we started to realize that this whole chicken keeping experiment was real. The chicks were on their way and we were moving as fast as everyday life would allow. We spent every spare moment measuring, cutting and hammering. We got creative and fit the repurposed building materials into the overall design. A spare cabinet door was paired with a piano hinge and a clean out door was born. An old window that had been gathering dust in our barn for many years was custom fit into the facade of the coop. While the screen had seen better days, once we had wrapped it securely in a piece of hardware cloth, it provided safe ventilation for the birds that would call our coop home. We continued to work during the hot summer while we counted the days until our chicks arrived. They did arrive, and the coop did get finished in time for them to move in before winter settled in. Adequate Space – Most resources will suggest providing at least 4 square feet of space per bird. 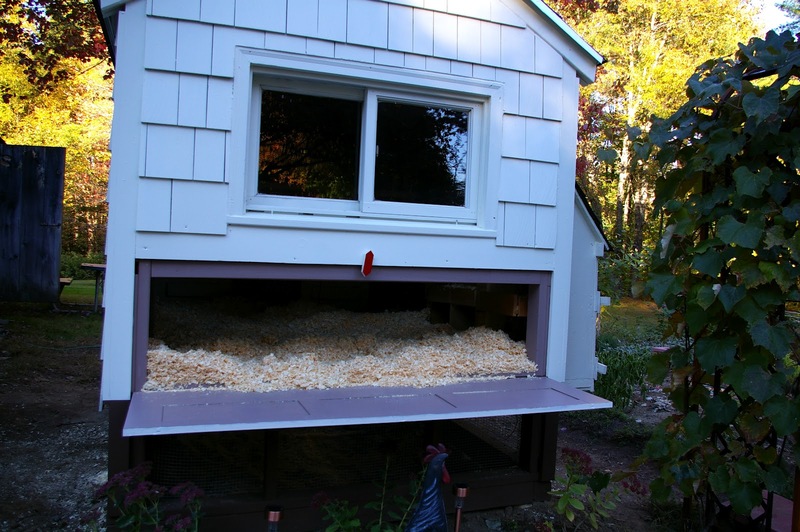 Our coop measures 6 by 8 feet, for a total of 48 square feet. This allows us adequate room for a flock of 12 hens. Watching our hens move around in their surroundings, I simply can’t imagine them having any less room to live in. I’m sure that hens who spend their days free ranging could flourish in closer quarters, but as my hens do not free range, I cannot personally attest to that. Good Ventilation – When we were initially planning the coop, I kept reading that ventilation was essential, even in the winter months. I found it hard to accept that I would want to purposely invite the bitterly cold winter chill inside the coop after we had worked so hard to make it a warm and inviting residence for our hens. I was wrong. 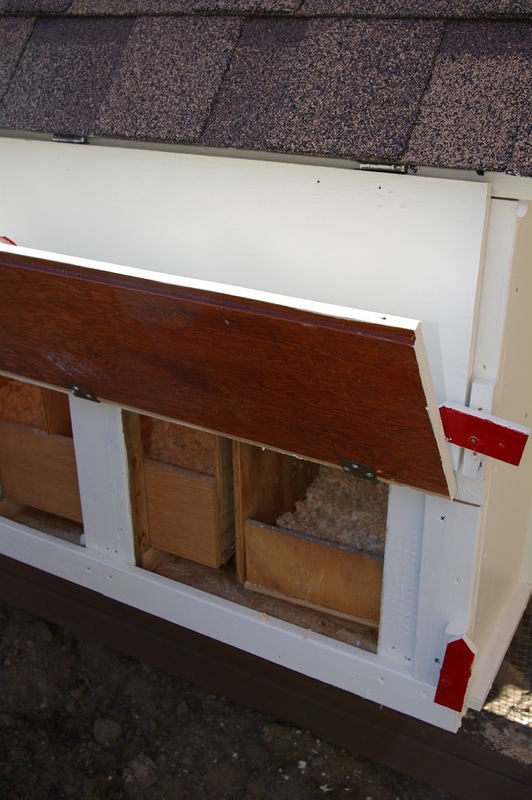 Ventilation is critically important to the health of the birds living in your coop. The amount of moisture expelled by your flock as they exhale is substantial. 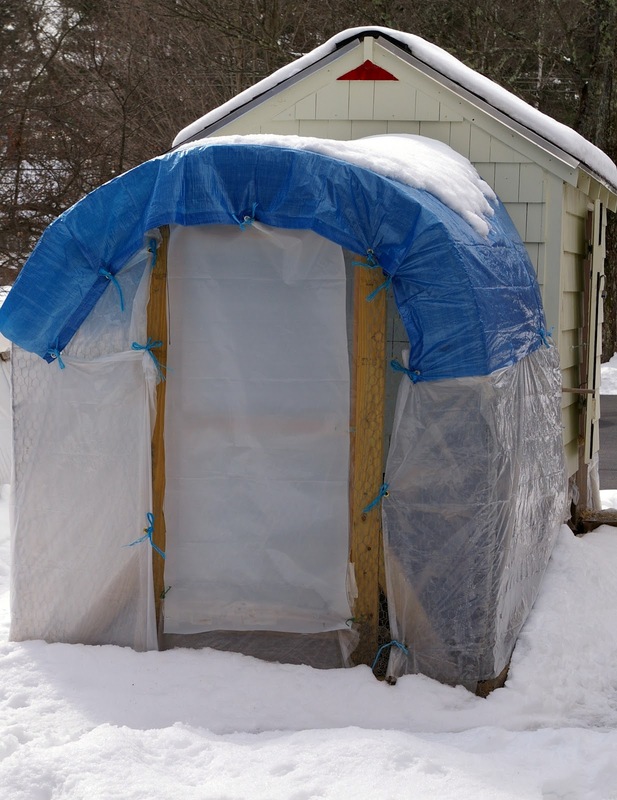 Without enough ventilation to dissipate the moisture, the coop becomes the ideal environment for pests like lice and mites to thrive. The bedding in the coop and nest boxes will remain moist and become the ideal breeding ground for these pests, as well as mold. Our hens much prefer a bit of fresh air to a few degrees of warmth. We provide them with as much fresh air as possible by utilizing an interior screen door, front facing window, and a rear vent to allow hot air to escape. Exterior access to the nest boxes – The construction of our nest boxes took a great deal of time. My father labored for hours to engineer them from the materials on hand. 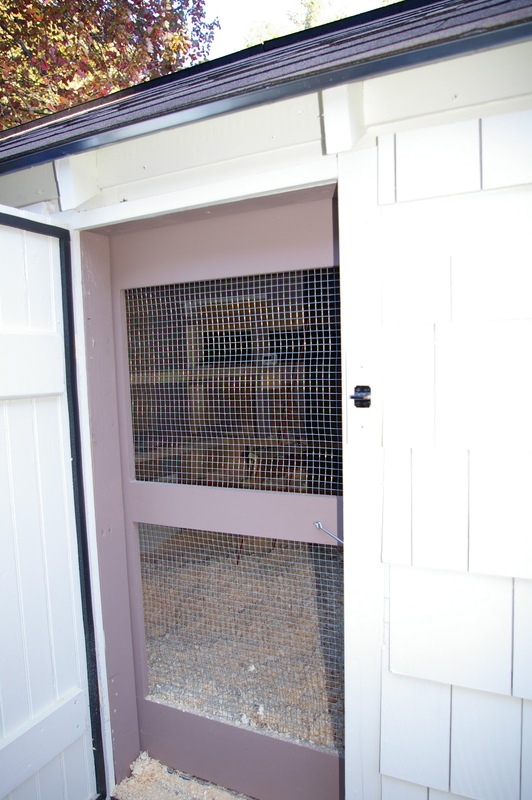 We used cabinet doors and hinges to provide easy access from the outside of the coop. Doing so allows us to retrieve fresh eggs without having to enter the coop. Being able to retrieve eggs when not wearing coop attire and Wellingtons has been a nice feature. Opening those doors is like unwrapping a package on Christmas morning. It’s a daily ritual that the whole family happily participates in. Access to the outdoors – Our hens love to spend time outside. The moment the sliding door opens in the morning, they exit in single file fashion. 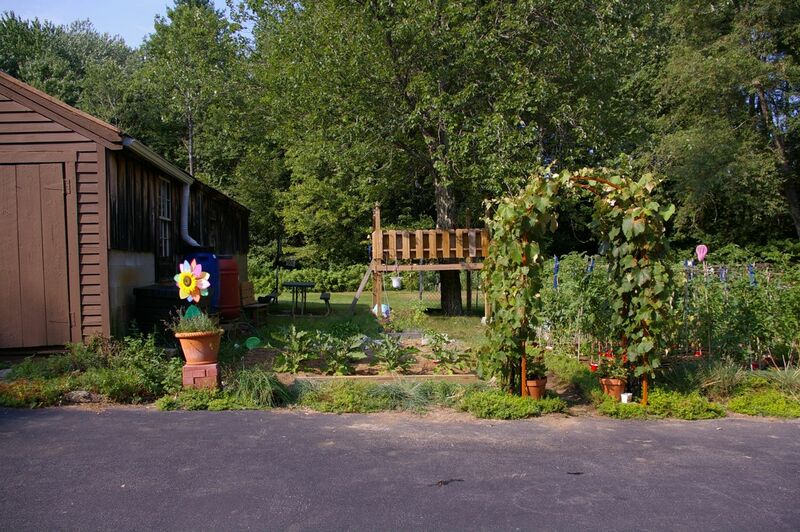 Their outdoor run has evolved gradually over the time that they have called 1840 Farm home. Initially, the frame from an outdoor dog pen was covered with chicken wire to provide an enclosed space for our girls to enjoy the sunshine. It worked quite well, but had a few limitations that made it less than ideal. Last fall, we constructed a more permanent solution, using rigid galvanized cattle panels. We have been thrilled with its durability. It withstood the heavy snow load last winter better than we could have ever hoped for. With the addition of a tarp, it was completely enclosed from the winter wonderland right outside. The enclosed run allowed our hens to spend every day of the winter outdoors in spite of cold or snowy weather. mentioned, we used a large cabinet door and a piano hinge. It allows us to simply open the latch, lower the door, and use a rake to pull all of the bedding out of the coop and into a wheelbarrow or wagon. Cleaning the coop is so quick and easy, even in the winter. If you have ever cleaned a chicken coop before, you know that making it as painless as possible is a definite bonus. Over the coming months, I’ll be sharing these features in full detail. I’ll also be sharing the elements that I wish we had constructed differently. In the meantime, let me share the most important piece of coop-planning advice I have with you: Relax, take a deep breath and enjoy the experience. What’s your best piece of coop-planning advice? I’d love to hear all about it and look forward to reading your comments. Carol, not tacking/glueing the linoleum down is a new thought along the road to learning how to build a coop before the first biddies’ show up. Most blogs/articles tack it down somehow. Jennifer, it would be nice if some dimensions, work techniques were included with the progress of the project as I have to build this thing mostly myself. I can do ‘squares’, miters are a lot harder. Most have the nest boxes outside the coop but no one tells how to attach it. The outside door panel looks a lot easier to reach inside. I’m a newbie and have read so much, I have become confused about breeds, care, coops, protection, etc. I want to have a place set up for spring buy and have yet to find “the spot” as anyone that I ask that looks, doesn’t like any of my choices. I’m not interested in raising my own chicks [no way to kill the excess roosters] but I have heard that a rooster is good for protection. Also, some roosters crow all day and some are relatively “quiet”. At the fair [they didn’t note the breeds on the cards, bummer], some chickens were HUGE, while others were “normal”, and then there’s banties. I would like to have 3-5 ‘regular’ size chickens, though those BIG guys likely could hold their own with the cats. They could have some ‘free’ range if I can protect the garden area. I’m thinking of putting either concrete blocks or railroad timbers around the perimeter of the chicken coop/run-yard to keep digging predators out. I’m no spring-chicken and easy access is an absolute “must” for me and the chicks. In order to make cleaning even easier, I bought a end of the roll piece of linoleum in the clearance section of a big box store for cheap, cut it to fit the coop leaving enough to go a few inches up the sides so the poop doesn’t get into the corners. When I clean the coop, the piece of linoleum slides out and gets washed and hosed down. After it dries it gets replaced and new shaving thrown down. It keeps the wood from getting dirty, smelly, or wet. Which keeps everyone happy. Illoura – Thanks for all of the useful information! You make some excellent points and I will be tackling the adventure of introducing new birds to our existing flock soon. I am already trying to devise a way to allow the birds to coexist without putting the young chicks in harm’s way. I hope that you will keep sharing your ideas! We can all use improvements to our systems and our layouts.I’m looking forward to hearing everyone else’s ideas! We live in a dry area of the southwest so moisture isn’t a problem, but I agree on the ventilation! I have a 12×12 shed coop and hope to get up to 12 layers by next year(I can allow up to 36 birds in the coop). I need to increase the flock since they are all old now- only get an egg a day when they aren’t in molt. I have 7 hens and 1 rooster (also four chicks hatched: 3 roosters and 1 hen). Lesson learned: I’ll be buying sexed chicks next time rather than hatching at home. One thing I would add to your design ideas is an area that can be fenced off somehow to allow for raising chicks before incorporating them into the flock. This keeps them and their food safe. I would certainly advocate combining some other elements of permaculture/sustainability-into the whole system, to cut some reliance on the feed store at least. Your garden area is perfect for this at the end of your season, but I can imagine the young plants would get eaten. I’ve recently discovered something called a “chicken moat”, which is a great idea for anyone with a garden – if you have the room and money for all the fencing required. Providing shade might be an important aspect to remember too. I plan to raise some meal worms or red worms – or even black fly larva- (something protein), to help defray feed costs and provide garden soil & fish bait. This can be done IN the coop using boxes/plastic bins, if temps are monitored (keep over 45 degrees in winter). With shelving along one wall, I can also raise a rabbit or a few as well, OVER the worm bins (allowing for an efficient and clean rabbit pellet-dropping system). I think rabbits left free in the coop yard will dig massive dens in the dirt and underneath the coop, and make it hard to clean. Great topic, thanks for bringing it up!